Eve on Art Its good to have a corner, don't you think? I've always had a Studio I have always thought of myself as an experimental painter. I have dipped into and explored many approaches. I'm a sort of a work horse and I'm dedicated. Along the way you have to learn to apply yourself. you have to have discipline But I wish I had more time. Thats the trouble. I lose so much because I'm hot on an idea and something interferes. 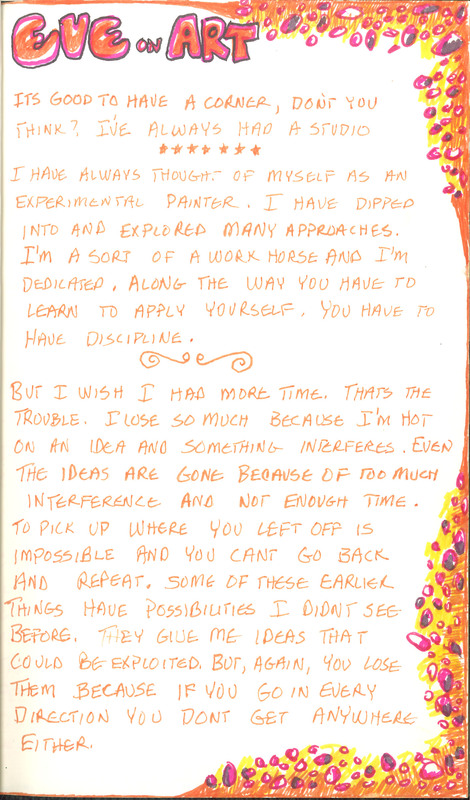 Even the ideas are gone because of too much interference and not enough time. To puck up where you left off is impossible and you cant go back and repeat. Some of these earlier things have possibilities I didnt see before. They give me ideas that could be exploited. But, again, you lose them because if you go in every direction you dont get anywhere either.